Do you want to meet other young parents? When you have a young baby it may seem like a hassle to get organised to go out, but a change of scenery can make all the difference! Joining our parent and baby group will give you the opportunity to meet other parents of a similar age. When you chat to other mums and dads you may find that you’re going through a lot of the same things and you can even share tips about how to deal with them. We can also run sessions about positive parenting, child development, safety, nutrition etc. We have facilities to welcome small groups of parents and babies. These groups are held in our own parent and baby room close to our office in the hospital. For larger groups we also have a more spacious room available at Croi na Gaillime Resource Centre located in the centre of Galway. Both of our venues are central, safe for your little ones, buggy-friendly with tea and coffee provided. Your little one may also enjoy meeting other babies. 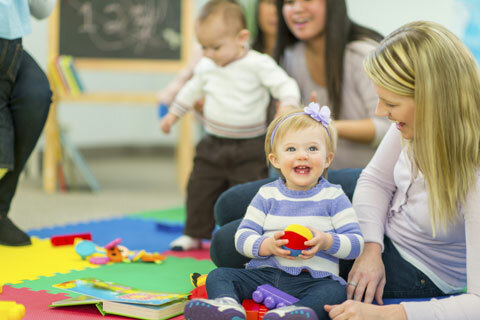 Babies love to interact with others from a young age and it’s also very good for their learning and development. There is plenty of space for babies to move around and there’s always lots of age-appropriate toys to play with. You can bring your baby from a young age, whenever you are ready. Toddlers are welcome too. These groups are run specifically for young parents who have been involved with our programme.